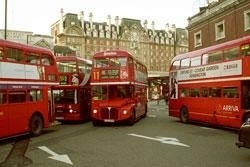 Synonymous with London are big red buses. Although the traditional ‘hop on, hop off’ Routemaster type buses have now all but disappeared the modern, sleek and sometimes trendy red buses remain an icon. Look out for the 'Heritage Routes' run by a handful of refurbished Routemasters as a moving tourist attraction. There are literally hundreds of different bus routes and stops throughout Greater London. If you are using Travelcard to get around London these are accepted on the bus network as well. Alternatively Oyster Cards (see London Underground) can be used for payment on buses. If you don’t have an Oyster Card or Travelcard you may need to purchase your ticket at the bus stop before you board a bus, especially in Central London. To try and explain all of the different routes available would take up most of this website. Instead I would suggest you look at www.tfl.gov.uk where there are great journey planners available which will show you maps indicating where the bus stops are (remember to be on the correct side of the road) as well as details as to which bus number you should use. Another good tip is to have a look on the inside walls of the bus stops in London. There is usually a map of the local area which shows which bus services are available and how often they run. For those planning a late night out in London then the night buses may come in handy. These bus numbers are prefixed with an N and start at around 11pm running through till dawn. These buses can be very rowdy and full of late night revelers. However a £2 bus fare is a lot more palatable than a £40 taxi fare after an expensive night in a nightclub or bar. Just one little thing, if you are on the main shopping streets in Central London it is often a lot quicker to walk than to wait for and then take a bus. Traffic can be incredibly bad and although the buses are able to use dedicated bus lanes, in places it can still be a very slow journey!